Did you Mi Account lock problem in your Xiaomi Redmi 6A? 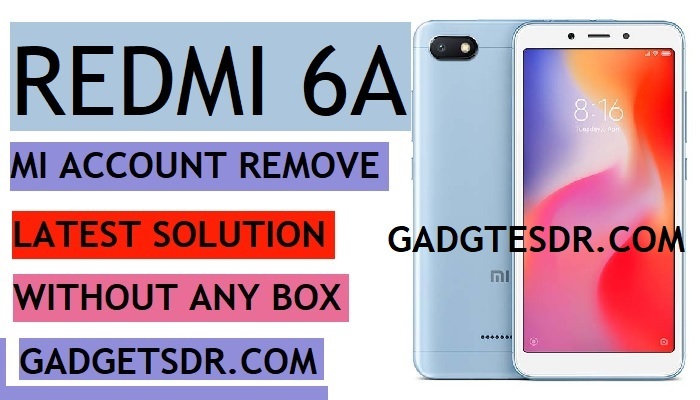 then here you will find the latest process to Redmi 6A Mi Account Remove without Any Box, so guys follow this method to Bypass Mi Account Redmi 6A (MIUI 10), Miui 10 comes with better security and better optimizations and also get too many features, now too many users facing Mi Cloud lock-in Redmi 6A devices, so here we share with you a guide to Redmi 6A Mi Account Remove, so follow this guide to Redmi 5A Mi Account Remove MIUI 10 very easily. Warning:- This method is only for device owners. Note:- This method we try on Redmi 6A. Tools that you needed to unlock Mi cloud a Computer / SP Flash Tool and Redmi 6A Mi Account Remove File. -First of all, download Xiaomi USB Driver and install the USB driver to your PC. -Then extract the downloaded Redmi 6A Mi Account Remove files to your PC. -Download all files below to Xiaomi Redmi 6A Mi Account Remove-MIUI 10. -In the last update Mi has updated all the security patch level to a new level, MIUI has fixed all the old method that help you to Bypass Mi Account Redmi 6A (MIUI 10). -Follow this guide very carefully. -Then extract all the files to your PC using WinRAR. -After that, open the extracted Redmi 6A Mi Account Remove files. -Once opened then there you will see “SP Flash Tool.exe”. -Waiting for Open the tool. -Now Give the file path of boot file “All in One DA.bin“. – file on extracted frp files folder. -After that, go to the “Format” tab. -Give below address from that box. (or you can find Address also in “FRP CODE.TXT”) to successfully Redmi 6A Mi Account Remove-MIUI 10 . -After changing the value, you have to connect your device to PC to successfully Bypass Mi Account Redmi 6A. -Then power off your Redmi 6A. -Now connect your Redmi 6A to PC. -After that, Click on “Start” button from sp flash tool to Redmi 6A MI Cloud Unlock. -Now you have successfully Bypass Mi Account Redmi 6A (MIUI 10). -Now just disconnect your device to PC and Power On you Bypass FRP. -After that, while power on your device complete initial setup on your device. Thanks for visiting us, Comment below if you face any problem With Redmi 6A Mi Account Remove Without Any Box -2019 | Redmi 6A MI Cloud Unlock |Bypass Mi Account Redmi 6A, we will try to solve your problem as soon as possible. you can check other some tutorial here to help you.